That smelled like something worth researching, so I dug in. After plotting a counter-argument involving how that progress has been made, I read ahead to make sure I wasn’t taking Pinker out of context or missing something, and guess what? The world’s most populous countries, China and India, played a central role in the global reduction of poverty. As a result of progress in China, the extreme poverty rate in Eastern Asia has dropped from 61 per cent in 1990 to only 4 per cent in 2015. Southern Asia’s progress is almost as impressive—a decline from 52 per cent to 17 per cent for the same period—and its rate of reduction has accelerated since 2008. In contrast, sub-Saharan Africa’s poverty rate did not fall below its 1990 level until after 2002. Even though the decline of poverty has accelerated in the past decade, the region continues to lag behind. More than 40 per cent of the population in sub-Saharan Africa still lives in extreme poverty in 2015. In Western Asia, the extreme poverty rate is expected to increase between 2011 and 2015. I keep tripping across similar situations. I’ll see Pinker make a point, run off to do research on it, then find he’s undercut his own point later. Which one sticks in your mind depends on your biases: if you think that we’ve made remarkable progress and can sit on the status quo, you’ll remember the part about cutting poverty and downplay the recognition that things have been uneven; if you think we’ve done well but can improve further, you’ll be thankful for the recognition that things could improve and might be tempted to forgive his fanciful flights. But this can lull you from looking at the whole picture. 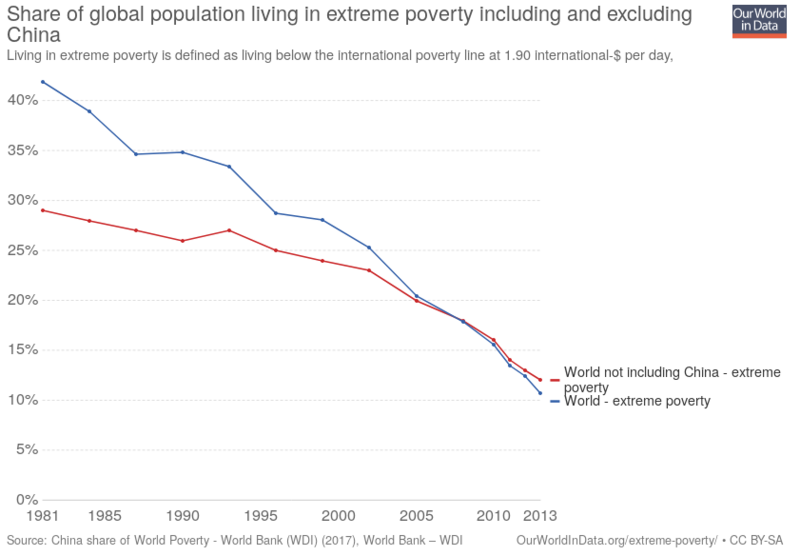 That $1.25 a day was based on the poverty rates of the poorest 10-20 countries, yet the median poverty line in developing countries was $2 a day at the time. Standards of living are different in different countries, so while the UN may declare $13 a day “middle class” in the developed world, $4,748 a year doesn’t come close to the $7,320 you’d need for one bedroom in shared accommodations in Calgary. It’s nonsensical to use a single metric across the entire globe, and to be fair the UN probably realized this; the real goal was less about hitting specific targets and more of an effort to change hearts and minds, as well as open up wallets that were beginning to shut. Nor were the results all that surprising. Pinker never considers why a set of goals agreed to in September 2000 could be so easily back-dated to 1990. In reality, the Millennium Development Goals were based on ideas that have been floating since the 1990’s, and their basic framework existed as early as 1996. The MDGs were developed by a broad coalition of organizations, and voluntarily agreed to by 189 countries. You wouldn’t have gotten that level of consensus had you proposed bold, risky targets to hit; the MDGs were designed to be achievable, from the very start. They were a PR stunt, albeit one that also saved lives and reduced misery. Except, as I quoted earlier, the UN themselves admit that China’s progress was instrumental in reaching the Millennium goal for poverty. Pinker’s citation which tackles this head-on sets up a straw-person – “The global decline of extreme poverty – was it only China?” – then easily knocks that down by showing that China merely played a significant role in reducing the global poverty numbers. 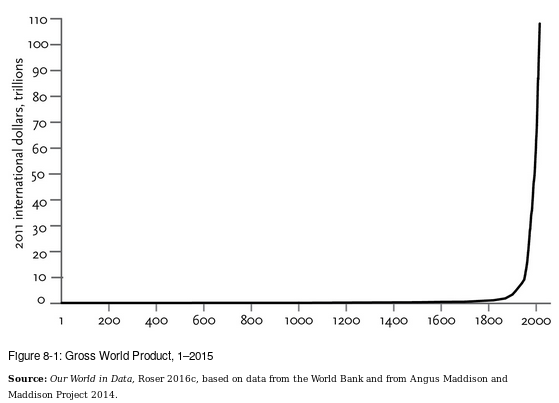 To generate that graph, you need to estimate the annual output of all human activity across two thousand years, then you need to correct it for differences in purchasing power and inflation. I’m surprised Pinker didn’t quote the guy who spanned a million years with similar techniques instead, he seems less cautious than the source Pinker used. Limitations to data quality also means that estimating the growth of GDP per capita over many decades, or even centuries, is a hazardous undertaking that, despite the best effort of statisticians and researchers, will always be surrounded by a degree of uncertainty. As a result, earlier estimates of relative income levels diverge substantially from standalone benchmark comparisons or independent estimates of relative income for those early periods. The graph has so many assumptions built in it’s not worth the photons. Yet Pinker puts it in the front of his chapter on wealth, calling the chart “simple but stunning” and spending three paragraphs hyping it up. He then turns around and spends three paragraphs pointing out some (but not all) of its limitations, and concludes “A person whose wallet contains the cash equivalent of a hundred 2011 international dollars today is fantastically richer than her ancestor with the equivalent wallet’s worth two hundred years ago.” The 1818 equivalent of $100 is substantially less than the 2018 equivalent of that same $100? An honest inquiry into poverty wouldn’t have featured that graph. But attempting to show that demands a helluva lot of research and dead ends, in Pinker’s case. Ugh.